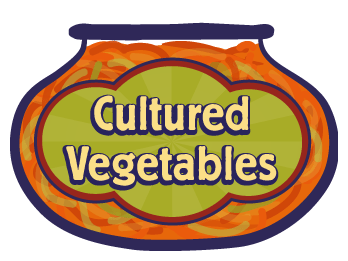 It astonishes me that everybody doesn’t know about Cultured Veggies – they are such powerful little scrub brushes for the colon and deliver such powerful anti-virus abilities. Over and over again I have seen these veggies knock out colds and flu and even work magic on food poisoning. The thing that most surprised me was how well they helped with my daughter’s chickenpox. My 10-year-old Holli was in a theater production with someone who had chickenpox, so everybody in the play (who had not had the virus) got it. I was actually relieved to see that she was exposed so her body would build up immunity to it. The body is actually made stronger after a virus because of its ability to make its own immunities to it. One evening, I started seeing spots on Holli. She is not one who gets sick, so she started to cry. She was afraid of what all this would mean. I checked her temperature and it was 101, so I knew she had chickenpox. I gave her a spoonful of cultured veggie juice and put her to bed. The next morning she had quite a few blisters and kept getting more. I told her she wouldn’t have school for a while, so she thought having chickenpox was going to be okay. The funny thing was, the only symptoms had been the fever that one night and the blisters. The second day I called my husband into the living room to show him Holli doing handstands in the living room. The third day she asked me if she could go out in the backyard for a little while. Looking out the window, I see her twirling around in circles in her pajamas and jumping on the trampoline. I had given her cultured veggies, about a spoonful every six hours, but never expected this. I don’t know about you, but when I had chickenpox I was sick as a dog that first week. Was it the veggies? I cannot be entirely sure, but I have seen them do miraculous things; from curing food poisoning in an afternoon, to stopping severe vomiting, killing Candida, and helping with colds and flu. These foods have guided me to living a healthier life. They gently pointed the way for me as I followed the bread trail they left for me. These are just a few of the many, many stories giving witness to their ability to heal and make well all who consume them. I am counting my blessings every day that these foods made their way to me. Don’t take my word for it, try them for yourself. 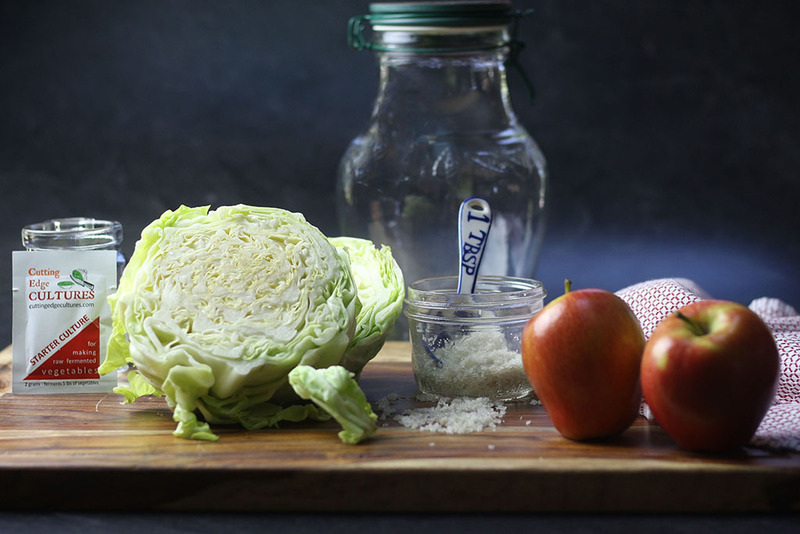 Get started by picking the food that most interests you, kefir, kombucha, cultured veggies or water kefir. I have lots of recipes and instructions to help you. Pick the one that most interest you and get started getting culture! 50 Responses to "How I Fought Viruses With Cultured Foods"
The average American spends 7% of their income on food. We spend 20% of our income on food. So yes, probiotics, raw milk and organics make a difference. It is worth it, but it is a major shift financially. 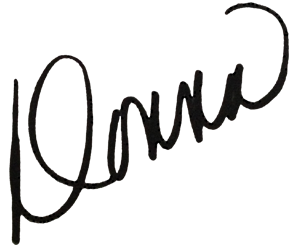 Donna, We love your website! 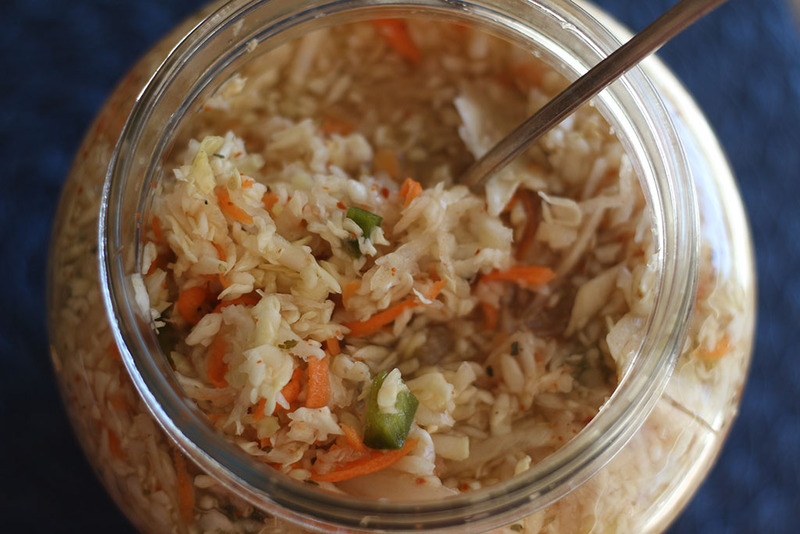 All fermented foods and drinks are awesome! 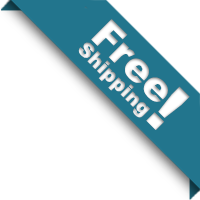 There is starting to appear on the internet questions about mixing colostrum with kefir and other fermentations. Have you ever had any experience with it? It would appear from our research that this would be the ultimate DNA restoration and regenerator for the body. What are your thoughts? Thanks! I don’t have any experience with this although many claim wonderful things from it. It something I hate to make claims on unless its something I have seen for myself or heard from others who have tried it. Colostrum is a powerful thing and so is kefir so putting them together does seem logical and beneficial. Can I use raw honey to flavor my kefir without harming the bacteria? I have been following your posts about kefir. kombuscha and cultured vegetables. My interest is still there only I am scared yo make the change. I quit dairy over a year ago and drink only coconut milk and no other dairy products. I quit eating grains about two months ago. I just recently quit eating sugar and all forms of sweetbread. Will kefir. 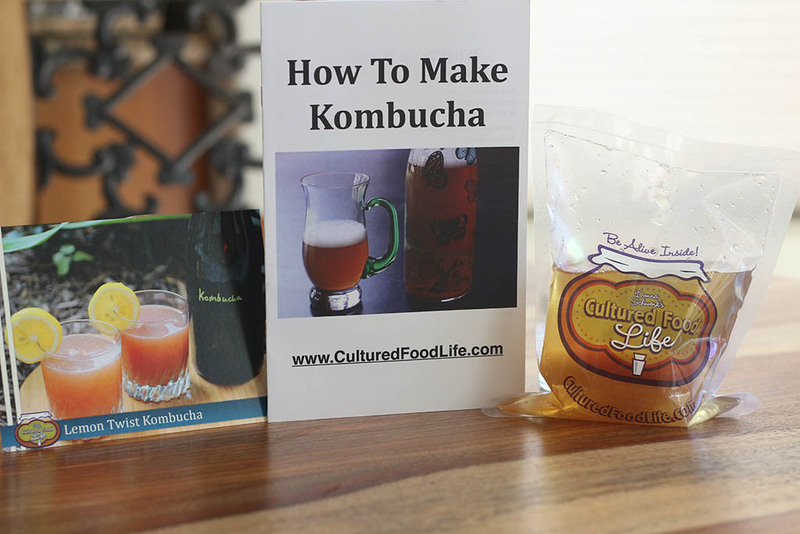 kombucha and cultured vegetables affect me any differently? My son is 6years old and ive been giving him vegie juice for about a month and kumbucha for about 2months.I started to give him a couple of teaspoons of milk kefir hidden in a smoothie for 2days.I decided to stop for a while cause he had a sore bottom.I made myself a smoothie with a half cup kefir and when i looked he had it gone.Hes been sick now for almost 2weeks.Temperature with chills then very week and now tummy ache and throwing up.My poor baby.How can i help him? Hi Donna I am having a lot of old ms symptoms . But I am eating them all . I am like you just straight in no gentle approach . Eventually it will subside . But energy levels unbelievable !!! That is why I know something incredible is happening ! Hi, Donna and all of you, smart ladies! Yes, its true, I came back to my kefir after a year of being off.. I stopped making kefir because of it’s milk nature and cow farms bad reputation (meaning- antibiotic and hormon additives etc). I never have had any lactose related or any allergies, but still got off of almost all dairy because of its silent inflammation effects on our body. I used to use only organic milk , but posterised. I’d like to know if raw milk is safe to use. What if it’s full of dangerous microbes (like raw meet for example)? And ,if its safe, can I find raw organic? Should it be whole milk or its too much calories to add daily? If it’s a 2% (or less) kefir, would it be as rich in probiotics as whole milk one o less? And, to Elaine’s question about havvy metal situation: please check Chelation therapy for havvy metal detox. I would (and will!) do this first, and then continue with kefir. Thank you, Elaine for sharing your concern! 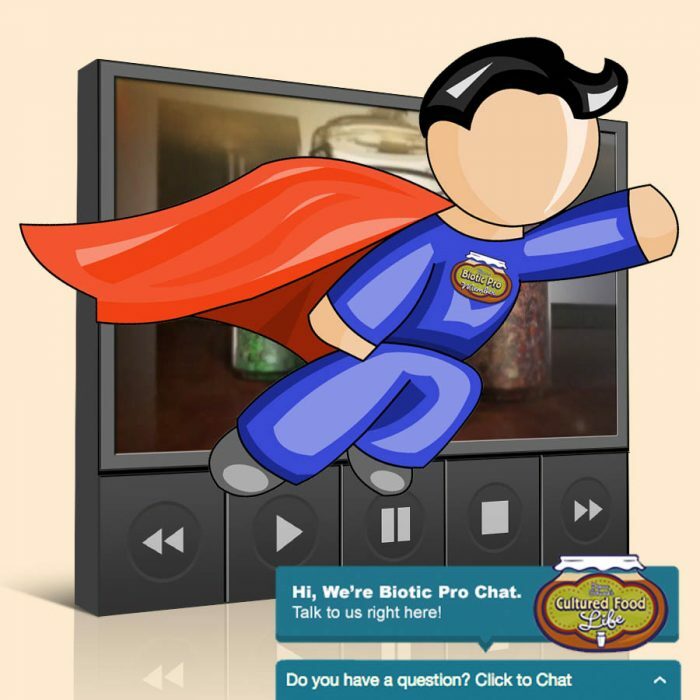 Google: shawellnessclinic.com to see why chelation. Sorry for my long comment. 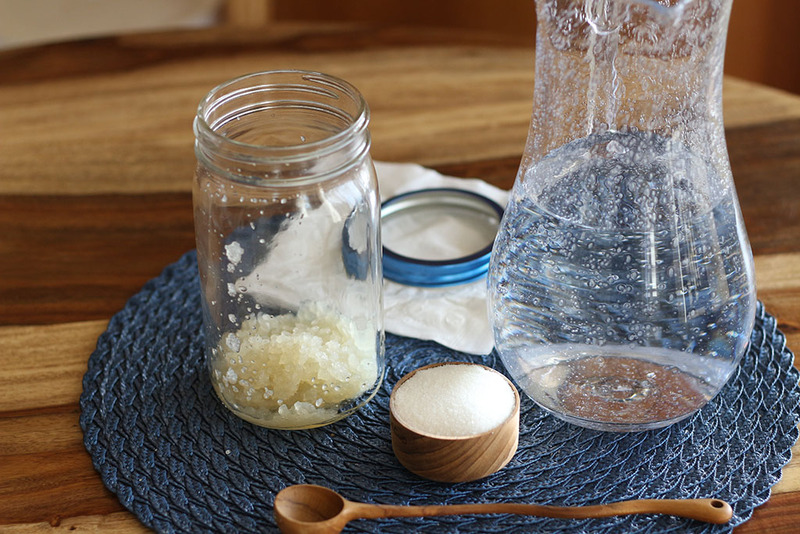 I just joined your site yesterday , and need to know all about how to make water kefir! Oh, and fermented veggies too!! Love it all!! Getting ready to make saurkraut! 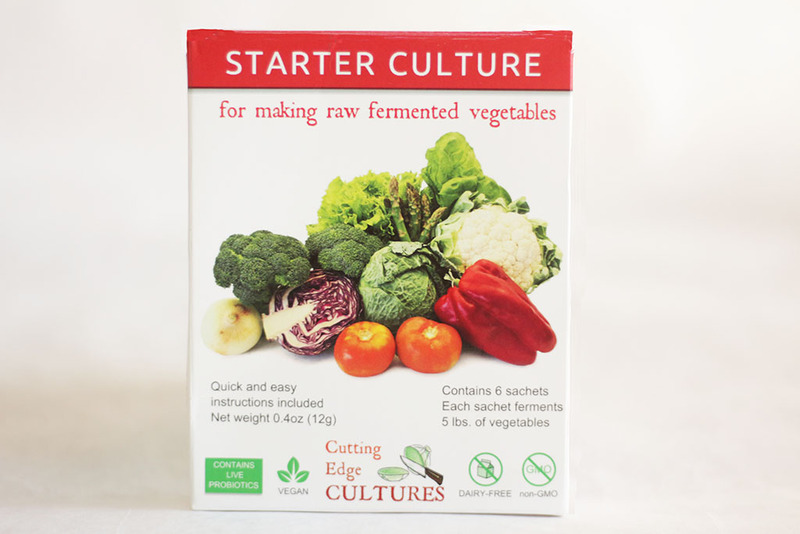 but I wanted to take your advice and get the caldwell starter for fermenting other veggies. Question: one packet will make a gallon of veggies. Can we then reuse the brine for a few times? As in we just keep putting in more veggies? Thanks for all the great recipes! You can reuse the brine, just put more veggies in and cover with water. 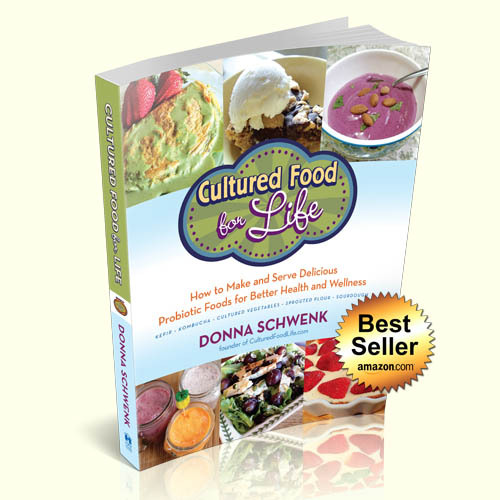 Donna…after adding the veggies and additional water, does it still need to sit out on the counter for several days to culture? Are you adding fresh veggies? Yes if you are. I love Kombucha soooo much, but it causes so much acid I can’t drink it. I do WK, lacto fermented veggies, MK, but the Kombucha I just can’t. Is there a secret? Because I still crave it. 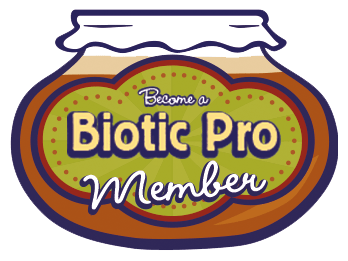 How are probiotics sold in capsules or pearls and those found in yogurts different then those you make or find in kefir and kombucha and fermented veggies? My fermented vegetables were accidentally frozen in my fridge. Will this affect the benefits of them? I love your newsletters and blog. I have learned so much about cultured foods. Am about to start making sourdough bread. It does diminish the good bacteria but not all of it. Hi Donna! Love your website and your book! However, feeling a little discouraged at the moment. I started incorporating fermented veggies, milk kefir and kombucha into my diet about two months ago and have been feeling so proud of myself for taking positive steps for my health. 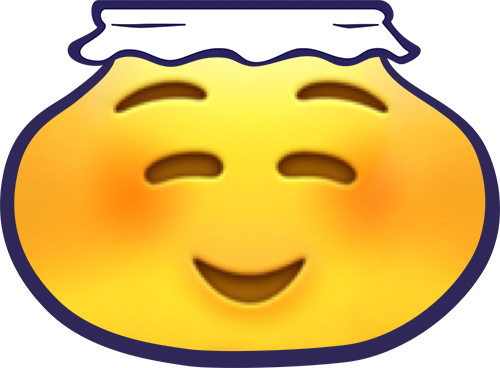 I’ve worked my way up slowly, as I have a bit of IBS, so too much at once and I start to get diarrhea. I’ve been doing well with that part, but now I have my second terrible cold in the last three months. Bleh! This is unusual for me as usually once I get my one cold for the season, I’m done. I thought I was doing so much to help my immune system work better, and now a second miserable cold. I feel like I just got over the last one. I know these foods are good for me in the long run, but I guess I was feeling all good about my healthy self and then got a smack down! Sorry, feeling a little whiny–lol! How long does it usually take for the foods to make your immune system a little stronger? The flu is just ramping up to a high here and I’m hoping I don’t get that as well! Lots of time you will detox and old virus’s that lay dominate in you will be eliminated. It is actually a good thing but can feel like your getting worse but actually getting better. Don’t be discouraged you clearing out the bad to make room for the good. Hi Donna. I have some raw milk that has soured. Can I use it to make my Kefir? Will it make the Kefir too sour? Thanks! P.S. I’ve really been enjoying your book. No you can’t use sour milk to make kefir it will need the lactose which will be gone when it has soured. 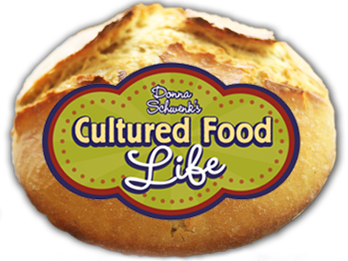 I am new to cultures foods. I started with some kefir and Kombucha and was doing great. After about a month my symptoms were horrible. I have diagnosed IBS and suddenly I was having a major IBS attack that has lasted for 3 weeks. I reduced my kefir to 1/2 cup a day and started doing Kombucha every other day..but I still feel horrible. Any suggestions? I love your site! Thank you so much for all the great information! Try taking a break and letting your body adjust it is a lot of good bacteria that the body needs time to adjust too. I am supposed to give up my raw milk for finacial reasons, can I make kefir from regular milk? whole? 2%? 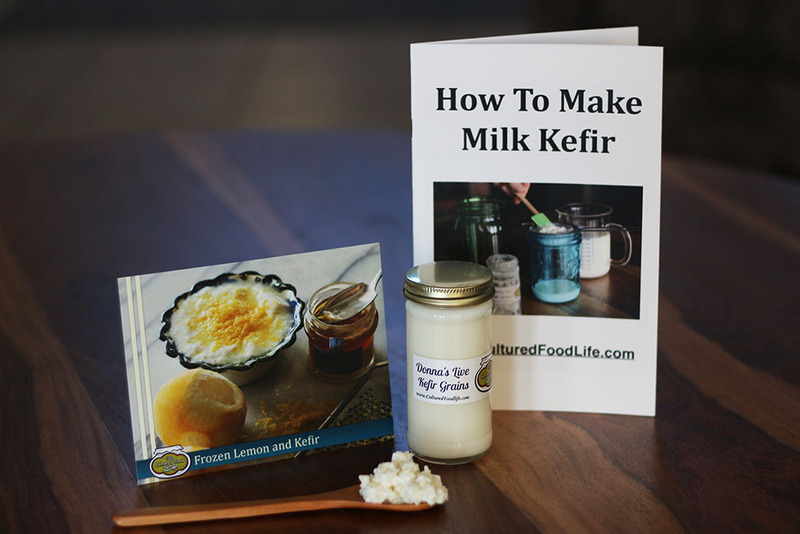 or should I just buy kefir made (LIfeway)….I have been making this for over a year and love it. 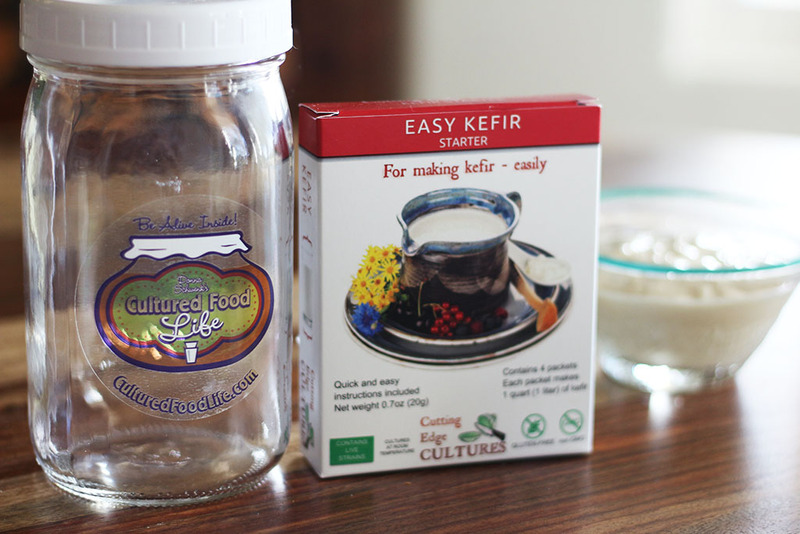 You can make Keifir with pasteurized milk and it will still work very well and a lot better than store bought kefir. It makes regular milk a super food and will help you greatly! I read that you have a pre-me that was ill. My sister just had pre-me twins and they are struggling a bit. How did you give them kefir and what amount? Just a spoon full in their bottle a small spoonful and they I added more the more they grew. No, it increases it! I use raw milk too. I’ve recently started making water Kefir, Milk Kefir and Kombucha to help with IBS-like symptoms. (undiagnosed) My googling often brings me to your site. I recently started drinking the kombucha daily and I noticed increased body odor. Imagine my relief when I found this page! Not only is it normal, but it’s proof that I’m detoxing and it will pass! Thank you so much! LOVE your site. Hello! I have a lot of stomach and G.I. Tract issues and I found out last summer that when I drank Kombucha, they would get a lot better. However, I started making my own Kefir about a month ago and I felt like that was helping me but then my symptoms got worse so I stopped drinking it just in case it was adding to my problems. Now everything is getting progressively worse and I was wondering if your body can go through some strange version of withdrawal. Like, did it get used to a bunch of probiotics and now in the absence of them, it doesn’t know what to do with itself?? Thanks so much!! When you start adding a lot of probiotic foods and have a large amount of bad bacteria and candida the bacteria start dieing off in large numbers and can create symptoms that feel worse temporarily. It is called a herxheimer reaction or a healing crisis. Bruce Fife wrote a good book called the Healing Crisis that explains this. Start slower and keep taking it but build up to it slowly. 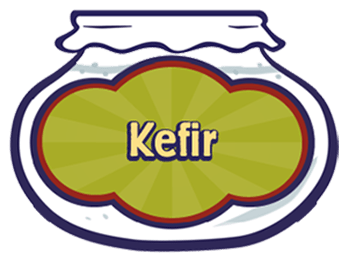 Kefir is really strong and can go to work in a big way in the gut to bring balance. There was a shift going on inside of your gut between which bacterias were going to dominate and really bring you back into balance. Does this make sense? I hope you feel better soon Rachel. You deserve to feel great. Keep me posted, and just start out with 1/4 to a 1/2 cup of kefir a day. Maybe some kombucha too. Donna, I have to thank you. I love CFL! Love all you put into creating it. I am a kefir both milk and sugar, kombucha and fermented veggie lover and enjoyer! Thank you! It does seem like it may have been from some sort of detox reaction. Our bodies naturally detox starting at a certain hour during the early morning, and I think that may have been it. I just finished drinking about 8 ounces of it and I haven’t had a single adverse reaction. My husband was so excited to see all the great information you have so we purchased your e-book. Next month we’ll order the hard copy. 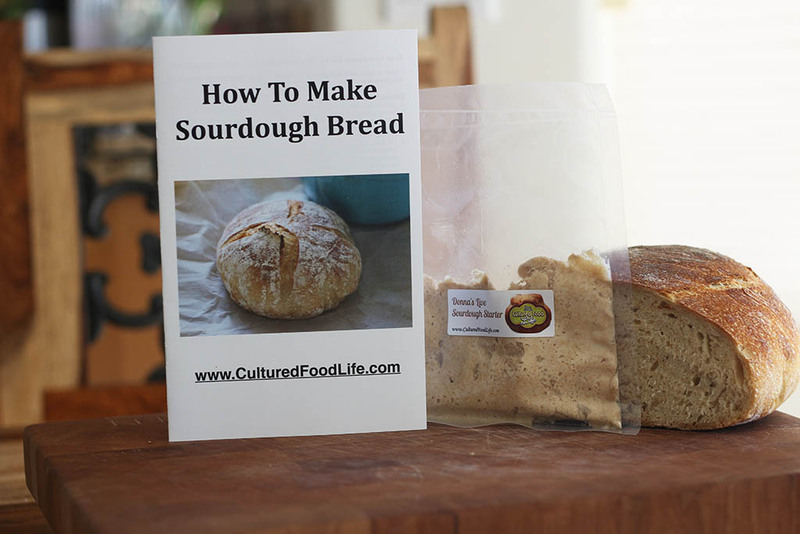 I’m excited to try the sprouted sour dough breads! It does sound like it was a detox reaction. I talked to my friend today and she said she drank it at 3:30 in the morning because she was so tired. Interesting that you drank it later too. I learn a lot from the experiences of others. It feels to me like we are all in this together helping each other find our ways. Thanks for commenting Angela, and thanks for buying my book. I think I am already a member on your site. Thanks for asking. This is the first time I’m visiting your site. 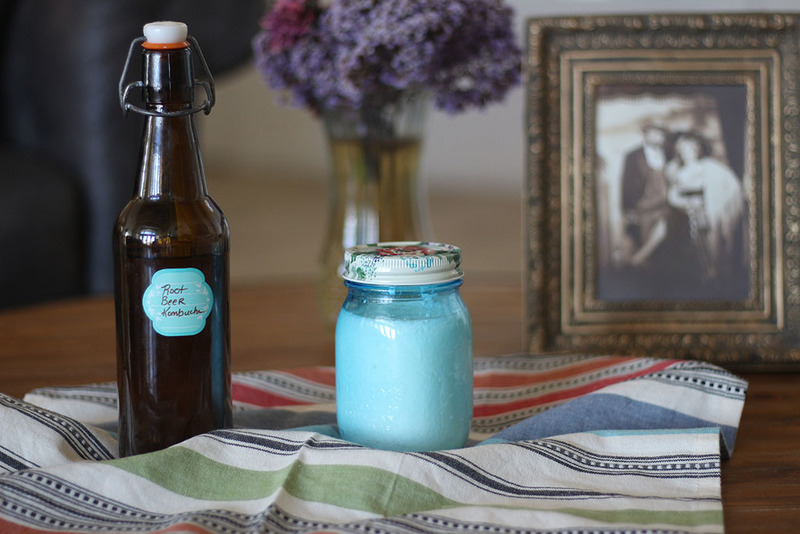 I was looking this morning for some advice on the detox factor with lacto fermented sodas. We just opened our first batch of ginger ale last night. I didn’t have a reaction to it at first, but then a few hours later (I couldn’t sleep in the middle of the night) I opened a bottle and started to drink it. I started to sneeze, my nose started running and I started coughing and wheezing. Has this ever happened to you? Could it be a detox reaction, especially since I drank it at around 3:00am? Sorry for all the questions. I just posted today about our progress in making the soda on our website, and a few days we put up a video explaining how we made it. I’d like to follow up with some answers for why I’m sneezing and having that reaction (I don’t want to leave our readers hanging LOL). Thanks for all the great information you have here! I’m going to be like a kid in the candy store looking through your site! Hi Angela, I had a good friend who have a reaction like this. She already had been drinking it for a while and then one day she had a similar problem as you. She drank it later and was fine. She said she had been under a lot of stress and wonder if this seemed to ehance the problem she was feeling. She hasn’t had a problem since. She said, “it felt it was a detox reaction”, couple with the stress she was feeling. Keep me posted on how your doing and I will check out your site. I just started making my kefir 2 weeks ago and I love it. I can’t get anyone in my family to try it but my husband said “it’s okay to do something good for yourself”. I think meaning they will drink it when they are good and ready. So I will lead the way. I notice that some of my kefir is thicker than other batches. Any ideas? Also, I am surprised to see from the picture how many orange slices you have in your second ferment. Is that right? And the whole orange, not just the peel? I can’t wait to start kombucha in the future. 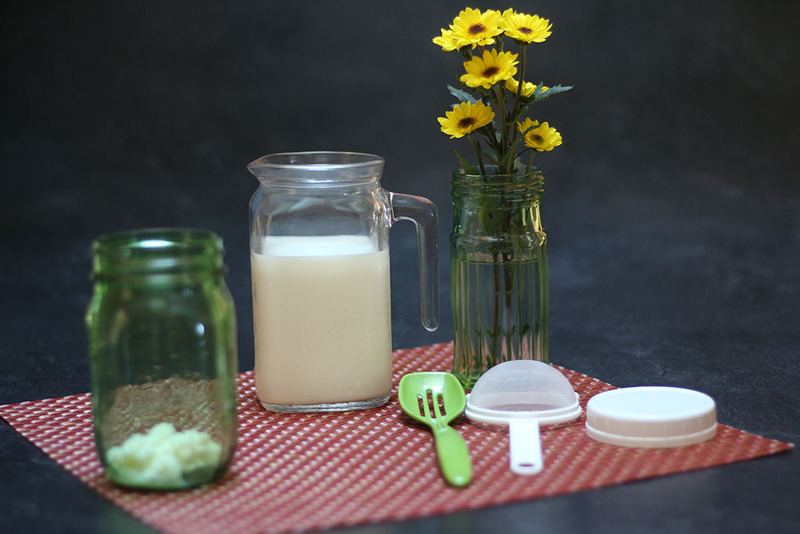 Kefir will thicken in the winter because of the temperatures. Actually this is my favorite time of year for kefir it is creamy and thicker. I usually add a couple of slices or the peel of an orange to about 4 to 6 cups of kefir. I was getting read to add more kefir to the picture but thought you would see the slices better if I didn’t. Yes, you can add the the slices of oranges or the peel. I am always adding new things to change the flavor. Donna~ I have enjoyed your blog and posts for well over a year now. I, too, have been “dancing” around with kefir and kombucha … taking them faithfully for a while and then backing off — who even knows why?!! 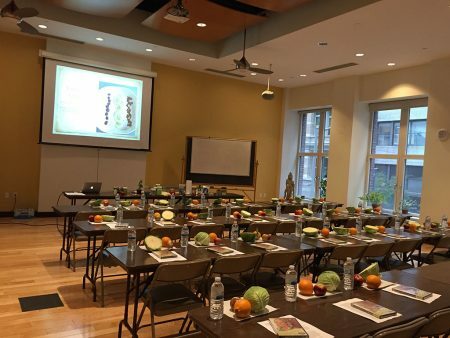 Thank you so much for sharing your passion about how these foods have changed so many lives. You inspire me every time to get back on the wagon and start again. God Bless and Happy New Year! May it be the best ever! Thanks Elaine, I see so many people start and stop with these foods including myself in the beginning. The funny thing is they will always call you back. I witnessed this with my friends. I always tell people that now you know you can’t go back. Even if you stop taking them it won’t be long before you will start consuming them again. You just know do much and there will always be that gentle reminder in the back of your brain reminding you of what you now know. Thanks for posting. 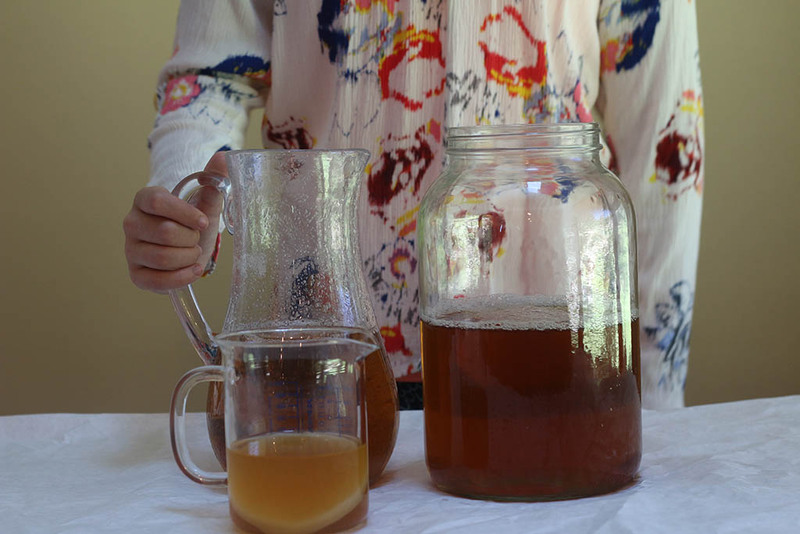 A quick question … I’ve read (multiple places) that kombucha kills candida but that can cause problems if you’re mercury levels are too high because the candida has bound to the mercury and if you kill the candida then the mercury is released into your system again and can cause multiple problems (whew – long sentence!). Have you heard this? 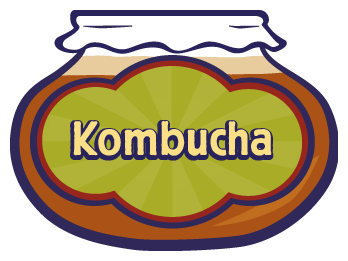 As a general recommendation how much Kombucha do you think we should be consuming? Thanks for your help! You know I have heard this too and I do not know the answer to all the inside workings of the body. 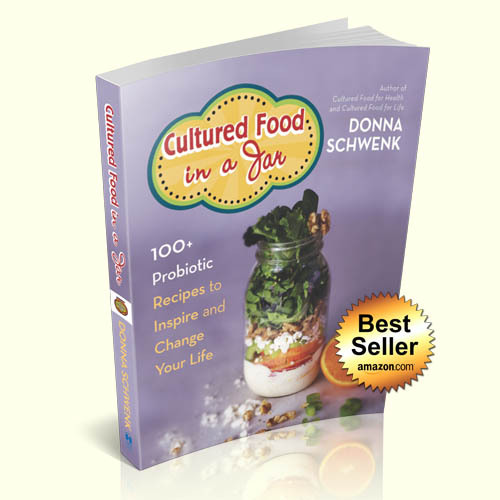 I do know that cultured foods help eliminate heavy toxic metals and pathogens and is wonderful for controlling candida. 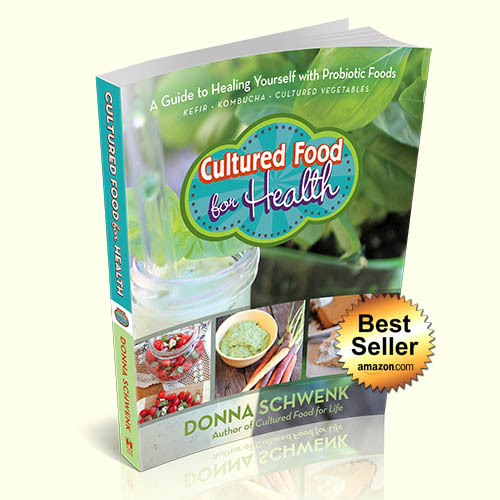 The more cultured foods you have the healthier your inner world, and the easier time your body has finding it’s balance. Every year I consumed these foods the more problems vanished from my life. Pollen allergies that had been around for 30 years, every year got better until they completely went away. Each year I got healthier till now I feel like 25 not 51. I would give anything if the cells of my body could tell me what they needed, but then I would probably become obsessive. Instead I gauge my health by how I feel. The better I feel the more I know I am the right path. I drank about 8 ounces of kombucha in the beginning now I drink more, but it varies. I love it that you ask these questions. I ask them too. Somehow the answers always come to me in ways that astounded me. They will come to you too. Your body is pretty smart, give it things it needs and it finds it’s own balance, all by itself. Elaine, you sound wiser than you know. 🙂 Thanks for answering. I’ve done a TON of reading and studying and have a lot of knowledge (for whatever that’s worth) ; ) but I don’t think I’m to the point I totally trust my body to tell me what’s going on. I think one of the most important things I need to do is stop relying on knowledge and information so much and just begin to listen. I truly believe the scripture that says we are “fearfully and wonderfully made” so I need to trust the Holy Spirit and this fearfully made body!! (end of sermon) You give me so much hope – I am also 51 – and am praying that very soon I can also say I feel 25!! That is truly my goal … vibrant health. You are such an encouragement! 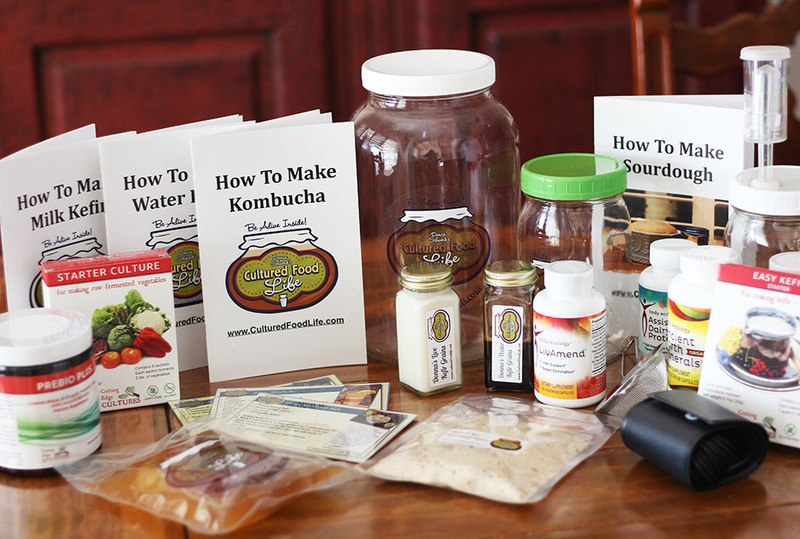 Kombucha is brewing on the counter and I need to go re-boot the water kefir and milk kefir and get back in a routine. I’ll be in touch and let you know how much progress I’m making. Have a blessed day! !